According to the preliminary results of an ongoing research where Joan Parera and Raquel Ubach are developing a new indicator for monitoring sea ice extent, seasonal sea ice is declining faster than perennial. Parera proposes to adapt the IceMap250 algorithm to European sea regions. 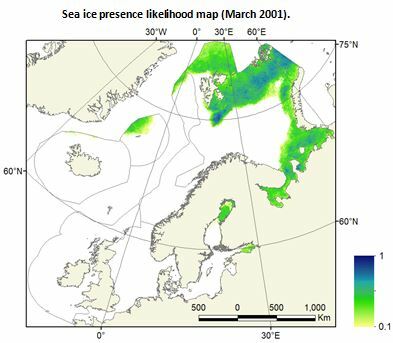 The use of MODIS optical and infrared imagery allows sea ice extent mapping at a higher resolution (250 m at nadir) than that of the commonly used satellite data, thus enabling a finer vulnerability mapping in the European sea regions to determine where conservation measures should be prioritized. The continued loss of sea ice in the Northern Hemisphere due to global warming poses a threat on biota and human activities, evidencing the necessity of efficient sea ice monitoring tools. 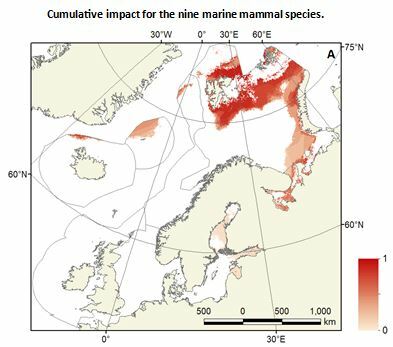 To prove the indicator’s utility and applicability, a vulnerability assessment has been carried out for nine sea ice associated marine mammal species, following the cumulative impact mapping methodology. Same preliminary results rank species vulnerability, being walruses, belugas and narwhals the most affected by the loss of sea ice. Impact has been found to be larger north of Svalbard, Franz Josef Land, and in the central Barents Sea, highlighting the need for conservation measures in these areas. 1) Seasonal sea ice is declining faster than perennial sea ice in the European sea regions. Perennial sea ice refers to the extent of the ice cover which is stable all year long, i.e. the minimum extent (September), while seasonal sea ice is the variable portion of the ice cover, i.e. the difference between the maximum extent (March) and the minimum. Contrary to the observed tendencies, sea ice in the whole Northern Hemisphere is declining faster in September. 2) walruses, belugas and narwhals are the most affected by the loss of sea ice FROM the nine analysed marine mammal species. The impact caused by this loss is especially severe in the northern coast of Svalbard and the central Barents Sea. 3) A new map synthesis approach has allowed the minimization of classification errors and the effects of atmospheric conditions. Together with other changes concerning the classification method, the modified algorithm has achieved systematically better total accuracies than the original IceMap250.